Third studio album from Norwegian Prog band Adventure. 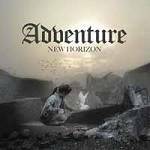 More information: Melodic prog rockers Adventure from Trondheim, Norway, are ready to release their new album New Horizon. The writing and recording of this new album began in late 2015 and was completed in March 2018. The album was mixed by Terje Craig at Craigtones studio and mastered by Jacob Holm Lupo (White Willow). The album features two guest artists: Atmasukha Ananda managed to squeeze in time to record on three tracks in the midst of his hectic schedule as a classical pianist. Flutist Kine Wallum contributes on three tracks plus on one of the bonus tracks. Kine is daughter of the legendary Prudence-frontman Prikken Wallum who passed away in 1990. For fans of both progressive and classic rock, like Pink Floyd, Uriah Heep, Deep Purple, Arena and Kansas and more!